With Boeing forecasting an unprecedented growth in the aviation industry and 558,000 commercial pilots required between now and 2034 the question needs to be asked – how should the industry respond? FTA has crunched the numbers and approximately 4,000 initial commercial pilot licences were issued across Europe (in 2014). If this trend continues, Europe will fall 750 short of demand, every year. The UK commands around a 25% share of that 4,000 total – putting pressure on ATOs to increase the number of high-quality pilots available for these new roles. As can been seen from FTA’s recent research into EU licence issues over the past four years, among other sources, it seems that UK supply cannot satisfy the future demand for qualified pilots. With only a handful of licensed and approved ATO’s in the UK but such a huge disparity in course prices, Jonathan Candelon began to think carefully about that £40,000 price difference. He realised that FTA needed to show prospective pilots, with even more clarity, that they do not need to spend £100,000 to get their qualification and become successful within the industry. 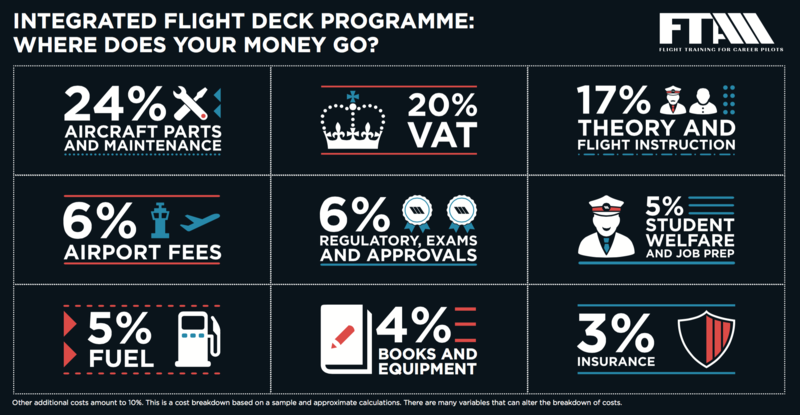 This has led to the trainer has produced an infographic (pictured below), based on the cost of their Standard Integrated Flight Deck Programme, to show how student fees are spent. FTA states that the majority of funds are spent on aircraft parts and maintenance and fuel (29%). Student safety is most important at FTA and all servicing, maintenance and checks are carried out in accordance with CAA regulations, to the highest possible standard. For FTA students, the second largest expense is the high-quality training such as theory, flight instruction, exams and equipment (27%). This includes salaries for experienced, qualified instructors and recurrent training – enabling cadets to receive the best training possible throughout their time at FTA. Student welfare and job preparation are also important areas, with training to ensure cadets are ready for the job market when they are qualified. What could you buy with £40,000? There are many licensed and approved ATOs in the UK yet there is a huge disparity in course prices, so Jonathan Candelon asked, ‘What would you do with a £40,000 saving on your training? We don’t want anyone to forget that for most people, who have to borrow funds or finance pilot training, this is still a debt. Even though our integrated courses start at £59,950 (for our Economy Integrated Flight Deck Programme) and is paid in instalments, it’s a huge undertaking and a significant investment. “We firmly believe that it’s not about getting the biggest loan or making that debt any larger than it needs to be, by spending £100,000 or more to succeed. We want pilot training to be more accessible for all, which is why we have worked hard to reduce costs and plan our courses and resources effectively, in turn, this allows us to pass on operational savings to our cadets and their parents’, he said. “Our group owns FTA’s base Brighton City Airport and Apollo Aviation, our aircraft maintenance company, which enables us to maximise operational efficiency. Our fleet of Diamond aircraft is maintained by our engineers, fuelled by our staff, flown by our students who are taught by experienced FTA commercial flight instructors and so on. Moreover, they are controlled by our air traffic controllers and kept safe by our own fire service. These factors do not make pilot training ‘cheap’ but they do make it more accessible for more people’ he added. “There’s no need to spend an additional £40,000 on a course that delivers the same qualification and quality of training. Just think what you could do with the extra money or ideally, not having to spend it or borrow it in the first place!” said Candelon. “We’re working hard to change the perception of flight training schools and the culture of excessively high-cost pilot training. It’s important that a commercial pilot licence isn’t seen as a commodity but it should be noted that spending up to £100,000 on a course does not necessarily make that course any better than a course that costs less – it’s all about the quality of instruction and the application of the cadet, rather than the price or profit margins’, he added. For any potential student comparing flight schools and courses like for like, it might be worth asking what that extra £40,000 guarantees and will paying that extra cost translate to a 70% increase in a cadet’s chances of employment? 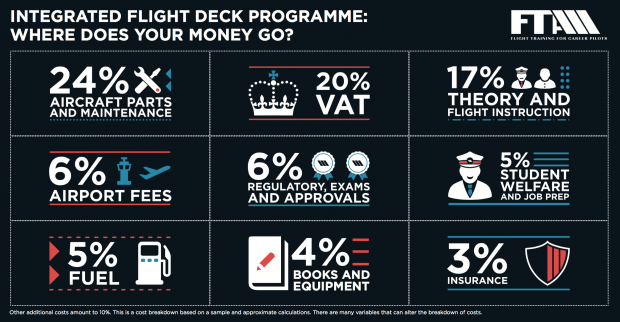 According to FTA’s latest annual employment statistics, 91% of cadets that successfully completed a professional course have already gained employment as pilots, so they feel that success is unrelated to course cost.